Jeroe Bosnam and Bianca Kramer from Utrecht University Library have recently presented a poster with the intention to address the questions of what drives innovation in scholarly communication and how these innovations change research workflows and may contribute to more open, efficient and good science. As they explain, changes in this landscape are driven by technology, policies, and culture, but in the end only take place because researchers and other stakeholders decide to adapt their workflows or recommend changes to others. As shown in the poster, the developing landscape is for an important part expressed through changing tool usage. New tools are constantly being developed by researchers themselves, small start-ups or big players, as reflected in the images above. A recent article (March 2015) entitled 'Attention decay in science' concludes that "the exponential growth in the number of scientific papers makes it increasingly difficult for researchers to keep track of all the publications relevant to their work". "Consequently," the say, "the attention that can be devoted to individual papers, measured by their citation counts, is bound to decay rapidly". The risk here, in a time where the number of publications is booming, is to overlook important data and theories due to the much larger pool of papers among which attention has to be distributed and the limited capacity of scholars to keep track of it. Apparently, the citation rate of papers increase just after publication to decrease rapidly after a few years. The authors specify that "the decay is also becoming faster over the years, signaling that nowadays papers are forgotten more quickly. However, when time is counted in terms of the number of published papers, the rate of decay of citations is fairly independent of the period considered. This indicates that the attention of scholars depends on the number of published items, and not on real time". We report here an extract from an article by the BPS (British Psychological Society) discussing some interesting findings from a recent study (by Pärnamets et al., 2015) which showed that the process of arriving at a moral decision is not only reflected in a participant’s eye gaze but can also be determined by it. Where we look betrays what we're thinking. For instance, given a choice between two snacks, people spend longer looking at the alternative that they ultimately choose. A new study digs deeper into this process and asks: is gaze direction also related to moral choices, and does it actually influence those choices? Today April 1st 2015, partners in the MindSee project from the University of Helsinki are in Atlanta at iUI 2015 presenting a paper titled "Exploring Peripheral Physiology as a Predictor of Perceived Relevance in Information Retrieval". iUI 2015 is the 20th annual meeting of the intelligent interfaces community and serves as a premier international forum for reporting outstanding research and development on intelligent user interfaces. iUI is where the Human-Computer Interaction (HCI) community meets the Artificial Intelligence (AI) community. Dont miss Oswald Barral's presentation today at 10am. Full program available here . David Kirsh, Professor and past chair of the Department of Cognitive Science at UCSD and Benjamin Blankertz, Professor at TU Berlin with a chair in Neurotechnology were recently invited by The Human Inspired Technology Lab in Padova to present their work as part of HiT's Featured Talks. Both Professors are affiliated with the MindSee project: Professor Kirsh is member of the Advisory Board, while Prosessor Blankerts is one of the partners in the Consortium. His talk gave an overview of the current state of BCI technology beyond medical applications and outline a path to explore and foster this direction of research toward realistic applicability. Blankertz is also this year's organiser of the International Workshop on Symbiotic Interaction. Having participated to last year's workshop as a key note speaker, Prof. Kirsh explored the basic principles of symbiotic using examples from evolution, contextual robotics, and devices that support disintermediation and distributed and augmented cognition. Their visit to Padova was one of the many examples of collaboration that the project seeks in order to disseminate results and strengthen collaboration between universities in Europe as much as overseas. Welcome to all partners to MindSee Consortium Meeting in London! Two productive days are expected with many interactive and collaborative tasks scheduled on the agenda. Reporting on new findings from our current studies are also expected. ...and a social dinner on Wednesday night. Enjoy! PAPER AWARD: "Bringing Psychological, Affective and Motivational Relevance Frameworks to Real Information Retrieval Systems"
Oswald Barral, a PhD candidate at University of Helsinki was rewarded with best Doctoral Consortium paper at the 2nd International Conference on Physiological Computing in Anger, France. The paper, titled Bringing Psychological, Affective and Motivational Relevance Frameworks to Real Information Retrieval Systems was written as part of the MindSee project. The aim of the paper was to raise a discussion around the possibility to bring state-of-the-art physiological computing methods to model subjective components of relevance. The author centers the discussion on the relevance types known in the information science literature as psychological, affective and motivational relevance. The paper presents a definition of these concepts, as well as an overview of the recent advances in physiological computing methods developed in information science and information retrieval. The 4th Symbiotic Workshop will be held in Berlin, Germany on the 7th and 8th of October 2015, hosted by Technische Universität Berlin. Following 3 successful events (Padova, Italy 2012, London, UK 2013, Helsinki, Finland 2014 - see proceedings here ) the workshop has managed to create and bring together an emergent and growing community investigating Symbiotic Interaction as a future paradigm. The workshop presents an overview of the symbiotic relationships between humans and computers as well as novel advancements therein. Representatives from the MindSee project were in Angers, France last week attending and representing the project at the 2nd International Conference on Physiological Computing. MindSee was one of the projects presented as part of the European Project Space Session, on Day 1 of the conference. This was a precious opportunity for the consortium to disseminate results as well as project's ideas to a community very much in line with MindSee's proposition and areas of research. Partners also participated to the Doctoral consortium, presenting a paper titled: Bringing Psychological, Affective and Motivational Relevance Frameworks to Real Information Retrieval Systems (Oswald Barral). 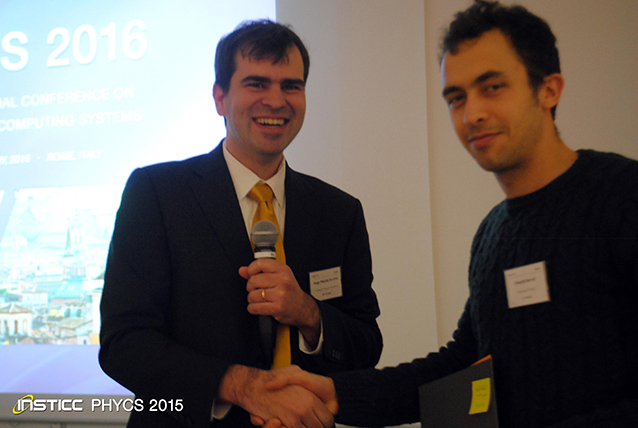 The paper was very positively received, so much that it won the Best Doctoral consortium award! The paper will be included in the CD-ROM of the proceedings of the conference as well as in the SCITEPRESS Digital Library. MindSee also showcased a dedicated booth with demos and posters to increase visibility and discuss potential collaboration with other EU/FET projects. The stand was particularly successful, bringing interest from many attendees. The MindSee project will be present at PhyCS in Angers, France 11 - 13 February 2015. PhyCS is the annual meeting of the physiological interaction and computing community, and serves as the main international forum for engineers, computer scientists and health professionals, interested in outstanding research and development that bridges the gap between physiological data handling and human-computer interaction. Look out for our stand, showcasing posters and demos on our latest research and findings. We will also be presenting the MindSee project on the first day of the conference, Wednesday the 11th, as part of the European Project Space Session. Given the relevance to our project, we would like to share this two days event to be held at Bournemouth University’s Executive Business Center on the 4th of February and the 22nd of April 2015.
rtists from fields as diverse as performance, music composition and dance are opening routes to create new audiovisual forms via Brain Computer Interfaces (BCIs). Transmission explores new strategies and existing avenues in the field of brainwave interpretation for arts and research. Bournemouth Media School, a center for excellence in media production hosts a 2 day conference to debate synergies, current developments and future objectives on the intersection between art and technology. Transmission brings together artists and researchers in the field of BCI visualisation and sonification, providing the opportunity to present ongoing projects, exchange ideas and to define the cornerstones of future developments. The Transmission Symposium offers a worldwide unique forum for an emerging network between arts and science. MindSee passes its first review! We are pleased to announce that the first review of the MindSee project was successful! The project is allowed to continue with minor modifications. Thank you to our Project Officer Dagmar Floeck, our experts and reviewers for the time and dedication shown to our project and for the precious feedback provided. Thanks to our Coordinator Giulio Jacucci and to all partners involved in MindSee for their hard work and continuous collaboration.